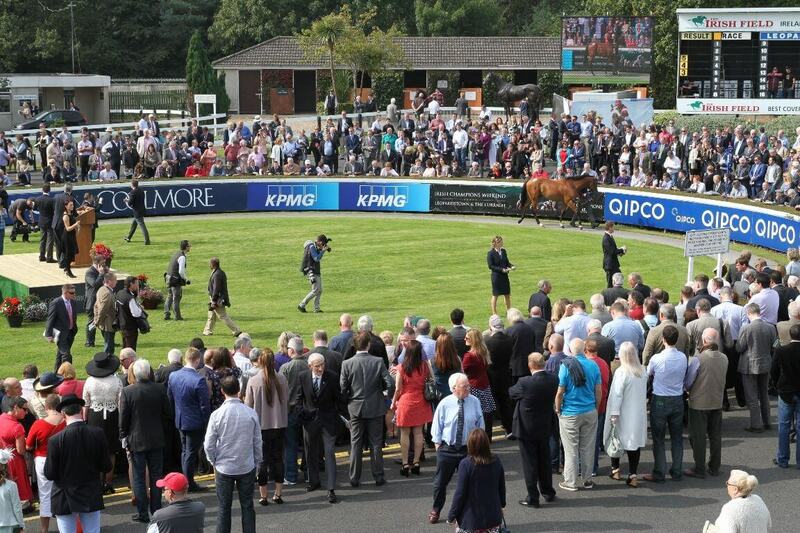 The Goffs Champions Sale is held before racing in the parade ring at Leopardstown Racecourse on the Saturday of Irish Champions Weekend, the 2016 renewal will be on Saturday 10 September. The sale is for select horses-in-training and breeding stock and nominations can be made online (click here) or by contacting Nick Nugent at Goffs on +(0)45 886600. For further information please contact Goffs by email at sales@goffs.ie. Goffs Champions Sale in association with Brown Thomas kicked off Irish Champions Weekend in style at Leopardstown yesterday as a huge crowd surrounded the winners enclosure before racing to see a select group of nine horses in training go under the hammer. The sales topping price of €450,000 went for the Dermot Weld trained Edelpour (Lot 3) from HH The Aga Khan Studs, a dual winner and second in the Group 3 Ballyroan Stakes behind Fields Of Athenry last time out. The three year old colt by Mastercraftsman was bought by Gerry Hogan on behalf of Barry Connell. Hubie de Burgh, under bidder on Edelpour, secured the next highest priced lot of the sale when going to €200,000 for Plot Twist (Lot 10), a winner on his only start for Andy Oliver at the Curragh in August. The son of Champs Élysées was bought on behalf of Australian agent James Harron. "The top price of €450,000 for Edelpour continued the excellent record of The Aga Khan Studs' horses at Goffs HIT Sales and is another endorsement of how Goffs will achieve the best prices in every category when we have the best horses. The vagaries of Horses In Training Sales mean that comparisons can be difficult to make, but yesterday's sale demonstrated that there is strong demand for quality. In addition, when offering horses with race entries, owners will often value them quite highly and, if that value is not met, are quite happy to keep the horse to race which, of course, they are perfectly entitled to do. Goffs Champions Sale is an integral part of Irish Champions Weekend and we are pleased to make our own contribution to this very special event".